Darkstone, known for his site, merchandise and fair booths which attract one's attention, has yet again started coding a game. 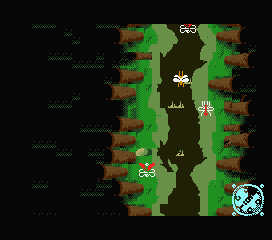 His #MSXDEV 2012 entry, named Pixiedust, is an automatic scrolling maze game for MSX2 or higher with at least 128kB VRAM. We'll have to wait a bit longer for more details. Thanks to Darkstone, the entry counter of this year's #MSXDEV reached four. There are still a few entries awaiting to be added to that. Maybe inspired by the famous PC game Terraria ? thx now working on level one gfx and i hope that i've got time to make more than one level( i think a level thaks when doing it in one it me) over 5 min. so whit retry and thing over a hour of 4. Return of the 2D platform games?